Actually, it’s tea this morning. My midsection was a bit troublesome yesterday, so I’m not going to put coffee down there just yet. Someone posted on Facebook yesterday that he’s been unfriended by a couple of people because they disagree with his political opinions. Because I know him fairly well, I’m pretty sure the people who unfriended him were fellow believers, probably from the church they all attend. I think that is very sad. Mr. Obama did all he could to divide us along racial and political lines for the last eight years. It is tragic that his legacy, if you can call such a thing a legacy, is only creating more division among people who should know better. After all, if other Christians are our enemies, who will we have left for friends? Believe me, there is a time coming when true followers of Christ will find very few friends. If Hillary wins, she will continue and enlarge Obama’s policies. If Trump wins, we really don’t know what he’ll do concerning limits on our freedoms. He is, at this point, an unknown quantity. I don’t have much faith in campaign promises. They’re quickly forgotten once the White House is achieved. My point this morning, however is not about politics. I’m truly and heartily sick of politics. It is my concern that we are allowing political points of view to alienate us in personal friendships, family relationships, and workplace relationships. This is wrong, and it is dangerous. If you will look back throughout history, and especially the history of the Marxist/socialist movement, political division leads to bloodshed. It leads to anger and hatred among family members who disagree. It divides us as a nation in a time when unity is more important than ever. I had a conversation the other day with a woman who is the polar opposite from me in her political views, but we are both believers. The conversation was civil and courteous. Neither of us will change our views. We hugged before she left, commenting on how thankful we are that our mutual love for God allows us to respect and love each other in spite of some clear political differences. What you are about to read is true. I know the people involved, and I see the pain. I see the frustration, and the toll taken on the marriage, the children, and other relationships. I have changed names and some details in order to protect the privacy of the people involved. They live in Anywhere, USA. This story, sadly, is repeated thousands of times across the United States of America, land of the free, home of the brave, and place of very little refuge for our warriors. Suicide among veterans is rising. Every day, 22 of our soldiers ,who have returned to a homeland in which they don’t feel at home, take their own lives. They are in despair. There is so little help from the government they fought to protect. Yes, we have Veteran’s Hospitals, and benefits, and therapy groups. The problem is that the need far surpasses the help available. Brandon was in Afghanistan about ten years ago. He loved being a soldier, and he was good at it. He loved the camaraderie, and he loved the order of the military. He’d grown up in a home filled with alcoholism, fighting, verbal and physical violence. The army, for him, was his first taste of feeling as if he actually belonged somewhere. He and the other soldiers spent a lot of time guarding the small village near the army base. They got to know the little kids, who, once they learned that the Americans weren’t there to hurt them, would come out every day and ask for chocolate, and to just hang out with the soldiers. One day, Brandon was ordered to train the gun on the top of his tank onto a busload of women and children. There had been a report that someone on the bus may have a bomb, and Brandon’s superior officer wanted him to be ready to obliterate the bus. At first, Brandon refused. He knew most of the kids, knew some of the mothers. He really had no choice unless he was willing to face a court martial, and as it turned out, there was no bomb. But that experience hurt his soul. Another time, he watched enviously while a dozen of his buddies boarded a chopper to go on some much-needed R and R. An hour or so later, the base was notified that the helicopter had gone down in a sand storm, all lives lost. And still another time, he had ordered one of his best buddies to take a certain position during a sweep of the village, and his buddy got blown apart right in front of him. He himself was hit by an IED. His wounds weren’t life-threatening, but he did sustain a traumatic brain injury (TBI) that went undiagnosed until ten years later. He has horrible migraines now, along with Post-Traumatic Stress Disorder (PTSD). I also believe there is a strong possibility he has Bipolar Disorder, and I advised him to see a psychiatrist to be evaluated for that. The rest of the story is one of complete frustration. He has searched for help in the Vet’s Administration, at two different Vet’s hospitals in the area, and even tried an out-of-state facility that works specifically with vets who have PTSD. They wouldn’t take him because of the TBI and because he hasn’t tried to commit suicide within 48 hours of his contact with them. The Veteran’s hospitals have put him off repeatedly. They’ve referred him to out-patient psychiatrists who (1) are not taking new patients (2)retired three months ago (3) will see him only once for a quick evaluation and medication suggestions but will not prescribe. They even set him up with (they said) a psychiatrist who would Skype with him from all the way across the country but who was actually a psychologist and could not prescribe for him. He has to get any scripts from the Vet’s hospital, not an independent psychiatrist. But the Vet’s hospital won’t fill a script for him because they haven’t seen him for evaluation. It doesn’t matter that he DID try to follow protocol. It doesn’t matter that everything he tried was a brick wall. Thanks in part to an administration that is strongly anti-military, huge hospitals like Walter Reed in Washington, D.C. have been shut down for lack of funds. That one just boggles my mind. I was there with my veteran husband several years ago while he got fitted for hearing aids, and the place was incredibly busy. Some of the patients there were transferred to other facilities; some were just sent home and told to follow up with private doctors. That’s not always a simple process, either. A quick search told me that 83% of doctors have at least considered leaving the profession because of Obamacare. I couldn’t find a supportable statistic as to how many have actually quit or taken early retirement. The fact is, when the government takes over anything, there is incredible bureaucracy that results in delays, rising costs, lost records, rules that no one knows about and many don’t understand. Efficiency decreases and the quality of care depends on financing, and we all know how broke the government is. Well, Brandon and his family are considering a move to a less-populated place near a Veteran’s hospital where he hopes he can get better help. They’re doing the homework right now to see if this is a good idea or just another effort in futility. In the meantime, Brandon can’t work because of his debilitating headaches. He gets some disability pay. His wife does what she can to bring in some income, but she also has three children and an angry husband to deal with. This is just one story. I know that it is representative of thousands all across this country. We need to do better. We need to restore funding to provide quality help for our soldiers.We need to quit making it totally unappealing for medical people to stay in their profession. Some verses to cross-reference include Lev. 26:40; Deut. 7:12; 28:1; 30:1; Jer. 17:24; I John 1:7. God makes this statement over and over in the scriptures: Obedience brings blessing, and disobedience brings correction. The key is in being willing. Judah had lost her way, and was no longer willing to be obedient. She had, once again, turned to the idolatry of the surrounding nations, engaging in all the immorality that accompanied idolatry. She was no longer concerned with the holiness of God, and would reap the reward for her disobedience. So I’ve been thinking, with nearly every post so far, how closely this all resembles America. Once a nation founded upon the principles of God’s Word, we have turned so far away, as a nation, that surely we will reap the discipline predicted for Israel. We cannot turn from His Law and expect His blessing. It just doesn’t work that way. Someone posted a video yesterday in which Mrs. Clinton says that our religious beliefs about abortion MUST change! Others are telling us that our religious beliefs about homosexuality MUST change. Those are just two examples. There are many, many more. When we accept the idea that our beliefs must change by turning from God’s Word and replacing Him with man’s philosophies, then we are disobedient. We won’t get away with it. Isaiah 1:16-18. “Wash you, make you clean; put away the evil of your doings from before Mine eyes; cease to do evil: Learn to do well; seek judgment, relieve the oppressed, judge the fatherless, plead for the widow. Come now, and let us reason together, saith the Lord; though your sins be as scarlet, they shall be as white as snow; though they be red like crimson, they shall be as wool. If you will count the words in blue, you will find that God gives Judah ten specific demands if they desire to be restored to fellowship with Him. The washing and cleansing are symbolic of a repentant heart. When we are remorseful over sin and truly repent, seeking forgiveness, then we will indeed put away our evil deeds; we will cease to continually do evil and learn to do well. To seek judgment is to seek to have discernment. The heart will be soft to see the needs of the fatherless and the widow. Best of all, God says, “Come to Me now, I pray you.” He wants our obedience, not to show that He’s the One in charge; He wants it because our obedience shows that we love Him (Matt. 22:37). He is ready and willing to teach us how to forsake our sin and cling to Him. That invitation still stands. As long as we have life, it is not too late to turn to Him. Isaiah had to know that the words he was given by God would not make him popular. I think that those who were faithful prophets were men of great courage, then and now. Of particular disgust to God was the appearance of piety and godliness that overlaid the behavior of His people. There was an overlay of religion that failed to cover the things that God said were an abomination to Him. It was that hypocrisy that offended Him most of all. The people were keeping certain elements of the Law. They were observing feasts and sacrifices, and burning their incense, but their hearts were very far away from the truth and the holiness of God. The conscience of God’s people, then and now, can become so seared that they can practice religion while living in sin, and feel no remorse. When God says He will turn His eyes away from hands lifted up to Him because those hands are of full of blood, He is not talking only about actual murder. The word blood is plural here, and points not only to murder but to acts of violence similar to murder, and to bribes which purchased the ruin of widows and orphans (Micah 3:9-11). God is not fooled by an appearance of godliness. He sees the heart. He sees our hearts. The appearance of obedience is meaningless when it comes from a heart of duplicity. The cities of Sodom and Gomorrah still lie desolate. 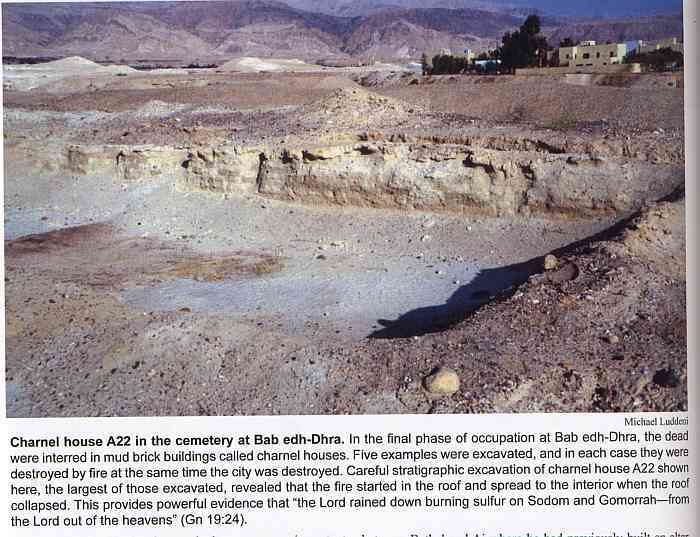 Excavation has shown that these cemetery remains burned from the top down, giving credence to the Bible’s statement of God sending fire down from heaven to consume the cities. Judah, says Isaiah, has been saved only by a very small remnant of the faithful from becoming like Sodom and Gomorrah, a strong indictment against those cities, and against the faithless of Judah. In Rev. 11:8, Jerusalem is described as Sodom. Ezek. 16:40 tells us that the sins of Sodom were pride, lust, luxury and cruelty, and now both the rulers of Jerusalem and the people under them are guilty of the same behaviors. Tomorrow we’ll look at the specific reasons God is angry with Judah, in verses 10-15. It’s quite familiar, really, when compared to America today. I’ve been in quite a contemplative mood this past week. Not sure why. Maybe because I see my country turning in a direction I never thought it would, no matter who wins this upcoming election. Anyway, this morning I’ve been thinking about all the Sunday mornings of my life.There’s been a lot of change over the years, but the one constant has always been that church is the focus. Growing up, Sunday meant Saturday night hair washing, a bath, getting my hair set in what seemed like a hundred tiny pin curls. There were clothes reserved for Sundays only. Remember Sunday clothes, school clothes, play clothes? I loved my Sunday clothes, especially if I had pretty shoes.We’d get dressed, Mom would brush out the Shirley Temple curls, and then we’d sit quietly and wait. No getting messed up. No getting dirty. I loved church, and always anticipated seeing friends I didn’t go to school with. Loved the opening exercises, where we sang and had Bible drills, and usually a flannel graph story. Church itself was a solemn affair back then, but not dull. We just knew we were in a special place. I loved the big pipe organ, and the congregation rising to sing Holy, Holy, Holy, Lord God Almighty. Still give me goose bumps to think about it. In my teens, I did my own hair. No more Shirley Temple, believe me. The “flip” was the in thing for longer hair, and we teased and sprayed. When my hair was shorter, it was less trouble. I went back and forth in length, enjoyed playing around with different styles. Dad had become the pastor of a little church in southern Minnesota, and I often got to play the piano. Also, I taught little kids, and was involved with my mom and sister in a trio; later, began to do solo work. Youth group was fun in the evenings, and we almost always had company for Sunday dinner. College was so different. No more family stuff. It was a leisurely day, and I looked forward to it. For one thing, there would be no work. I had a cashier job in a grocery store, and back then there weren’t any stores open on Sundays. It was good. Things sure were different 50 years ago! There was also dating going on, so special care with the hair, the makeup I was just starting to use, and the dress for the day. The preaching was good. The music was always wonderful. Then I got married, and at first Sunday mornings were fairly easy. But– along came four babies, and Sunday mornings became much more complicated. I’m a very organized person, and by the time the fourth baby came along, I had it down to a science. We always enjoyed a special breakfast on Sunday, and the kids didn’t get dressed until after we ate! I usually was also making meal preparations while breakfast was under way. Terry was on duty with the church bus ministry, so getting everyone else going was entirely up to me. Somehow, we were always ready to go in time. I do remember feeling worn out before we ever got to church, but it was always worth it. The church was big, full of excitement. The music was always great, and the teaching and preaching as well. We had a church family that we loved, Those were very good years at the church we attended. Well, time passes and things have changed. I’m still up early, because it’s about a 40-minute drive to church now. I don’t fix a big breakfast any more. We’ve changed the way we eat as we’ve grown older. Terry takes care of himself, and I sit here with my bagel and my coffee, relaxing with some good music in the peace and stillness before Terry gets up. It’s just a bit after 7 a.m., and we’ll leave around 8:30. It’s taken us a little longer to feel completely comfortable in our new church, mostly because of the distance, but that’s getting better all the time. We’re becoming as much a part of the ministry as we can, and we’re enjoying getting to know people. The thing that has been the glue down through the years has always been the Word preached faithfully, taught faithfully. The love of God, the dedication to His Word, has united people who share out faith with us all through the years. It’s a great heritage.